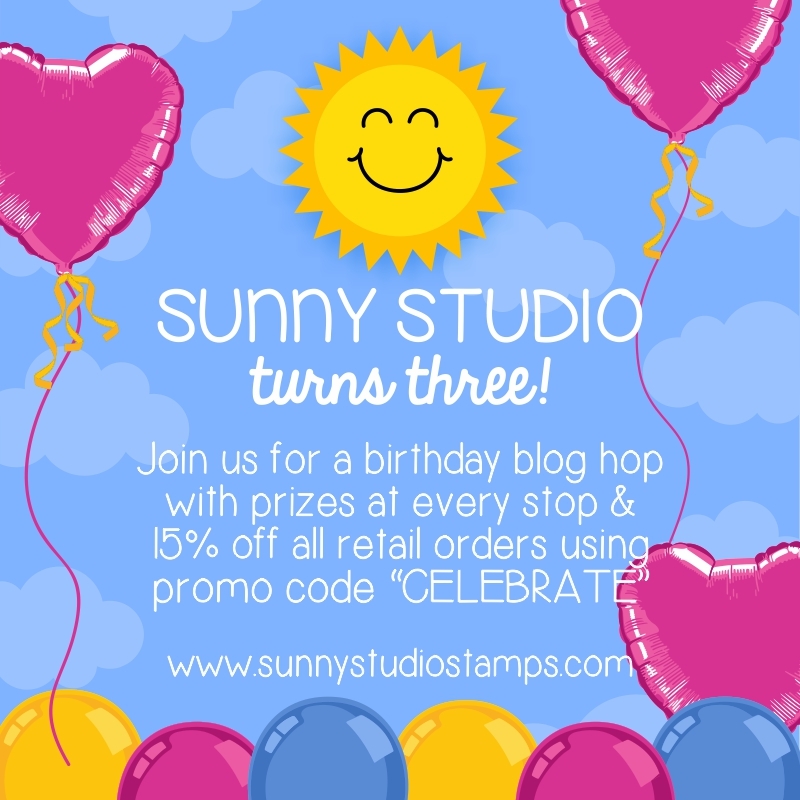 Hello and welcome to the Sunny Studio Stamps Birthday blog hop! SSS turns 3! Yay! Happy Birthday Sunny Studio and Mendi! Thanks for having me in the lineup today! I’m so happy to celebrate with you as I was already celebrating your grand opening 3 years ago. The hop begins on the Sunny Studio blog and if you have been hopping along, you should have come from Lexa Levana. Make sure you hop around to all of the blogs featured in the link list at the bottom of this post. You will find lots of inspiration and giveaways! For the first card, I used the Alpaca Holiday stamp set. These alpacas are so sweet and special! I kept my card simple to make them shine! I did a sponged background and added snow dots for a winter atmosphere! For the second card, I used the Alpaca Holiday stamp set again. I also used the mountain border stamp from the set that I LOVE! For the third card, I used the Rustic Winter Dies and colored all elements to create this winter scene. The sentiment is from an older released set called Santa’s Helpers. If you want to see all new products, you can find them all HERE! To celebrate this birthday, each blog stop has a $25 gift voucher to give away for a total of $350 in prizes. Leave a comment on each blog to increase your chances to win one of these gift certificates. The blog hop will run through Monday, October 1st (2018), 11:59 pm PDT. Sunny Studio is also offering 15% off on all retail orders using the code CELEBRATE through October 1st. Now it’s time for you to head over to the next stop but don’t forget to leave a comment here before you go for your chance to win. Your next stop is Juliana Michaels. Happy hopping and thanks for visiting! Cute cards but I love the deer scene! Everything is so adorable....great cards. Love all three cards. I like the way you created the scene in the cutout on the third card. Oh my gosh, those alpacas are some of the cutest I've seen! These are just gorgeous!! The alpacas are very sweet! I love the one with the floppy hat. lol The last card is my favorite. I just love a scene like that and the cardinal is my favorite birdie. These alpacas are so cute, and you have showcased them to perfection. Great job! Thank you for the inspiration, and lovely how you drew in the cardinal and deer. I love your cards. THe use of color is amazing!! They really pop! Wow, Francine! Love these. The cutout and trees is awesome. Love the deer card. great idea. Wow! Beautiful cards, you're an amazing cardmaker! Beautiful cards, I really love the rustic winter scene! Those are wonderful cards! Love your color choices, and those alpacas on the first card are my favorite, especially the little guy on the left! SO cute! I really like the teal-ish color on your first card. The alpacas really stand out with that background & the color scheme that you used. Thank you! Great cards; I especially admire the coloring. Fantastic! Your cards make me wish I could live in the cold climate again instead of here in the desert. Beautifully done! These llamas crack me up. I love your creations :). Love your cards! 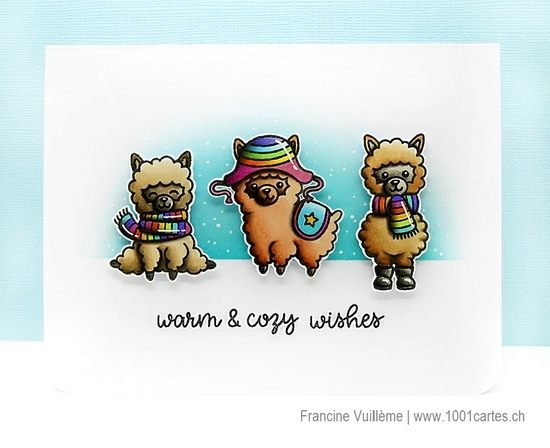 Especially like the inked background on the first card because it is subtle and lets the Alpacas take center stage! I love the coloring in all three cards - so beautiful! The card with the deer is so pretty. It's my favorite. Hi Francine! Love your rainbow attired alpacas--that is so darn cute!!! Great scene building. Also REALLY Love the Rustic Winter card. There's just something about deer that fascinates me. Thanks so much and have a blessed weekend. Hugs!!! haha ... LOVE the rainbow scarves and hats! Your cards are so cute and I love how you used the deer. Great job. Your coloring is sooo vivid and PERFECT! I love these llamas! I love your cards, the alpacas are cute. Your cards are all Soooo CUTE!!! I love all theee - the llamas just pop over the page... and your woodland scene is so serene. I really like the way you make your cards with a clean look. Thank you for sharing them. Beautiful cards! Your coloring is gorgeous! I love how you used some gloss for some of the areas of the cards too! I love the rustic winter dies you have used for your last card. Simple but elegant card. Beautiful cards, Francine! Your coloring is amazing, and I love the rainbow scarves and hats on the alpacas! Your Winter scene with the deer and birch trees is lovely. Thanks for the inspiration! Your cards are beautiful but I think my favorite it the cardinal card. Gorgeous!!! Amazing cards! Your coloring is beautiful and you bring such a gorgeous richness. Fantastic! great cards - love this stamp set! So much alpaca cuteness! You made them look awesome. Your coloring is phenomenal!! It is so great!! The Alpacas are very cute with a very lovely background. Your work is fantastic!! I have one stamp from Sunny studios and I love how cute their illustrations are. Francine you added those shiny stars this Alpaca needed. Love your card. Wow your cards are all beautiful! My favorite is that last one, the one with the birch tree dies and the deer. Such a pretty winter card... I just love that one so much! Thanks so much for sharing your beautiful work! Have a great day! Your cards are amazing! I love so many things in this release! Who knew that alpacas could be so stinking cute. I just love them. WHOAH! Cards number 1 and 3 just made my jaw drop - fabulous designs, and your colouring and attention to detail are amazing! What a wonderful set of cards Francine! Love your coloring and CAS designs! Thanks for the inspiration! Each of your cards is wonderful, but I think my favorite is the one in the forest. 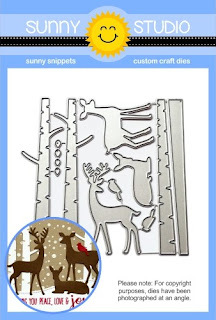 You have really made the Birch dies look very realistic, and I love the animals you included in your wintry scene. What a great way to celebrate 3 years of Sunny Studio stamps!! Your cards are adorable ! 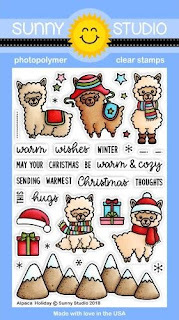 I specially love the Lamas' stamps set, they are so cute !!!! Thank you for the inspiration. Your cards are so very cute but I especially love the deer card. Your cards are so cute! I love those llamas - they are so darn cute! I hadn't noticed before that one of them has boots on! Love it! Thanks for the inspiration! I love all the ways you used the alpacas on the cards! (We have some about 2 miles away from our house!) However, the thing I like most is your AWESOME coloring!!! Do you have any Youtube videos? Fabulous job on the cards! Wow!!! I love all three of your cards!! The alpacas are simply adorable and that winter scene is gorgeous! Your coloring of the deer and cardinal is fabulous. I agree these alpacas are so adorable. You did an amazing job of colouring them. Love your card. Adorable --I like your coloring. I love both of your cards, but especially that beautiful winter scene! your coloring is just stunning! Thanks for sharing! Wow, your coloring is amazing. 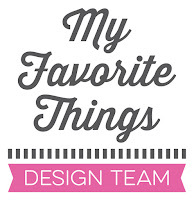 I'm particularly impressed with how you found the shapes within the silhouette die cuts. That's a recipe for disaster when I try it. But yours looks amazing. I especially love the details on the cardinal. Thank you for sharing your lovely cards for us! What wonderful cards. Love the alpacas. Such gorgeous, GORGEOUS cards. Thank you so much for doing the hop with us--I always look forward to your beautiful creations and it means so much that you squeezed us in. Big hugs! 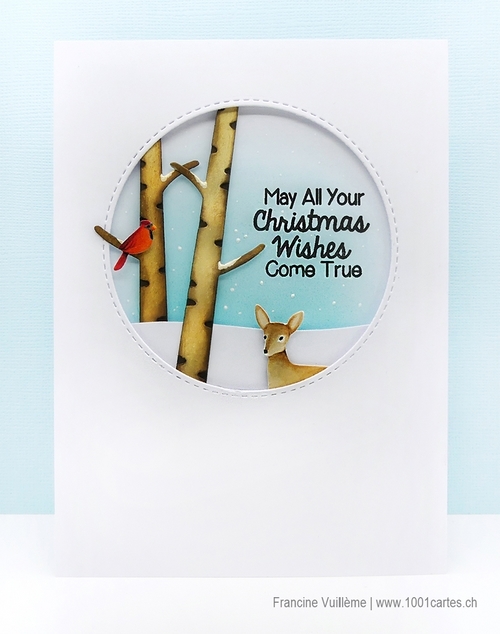 All of your cards are beautiful but that rustic winter dies card with those birch trees and deer is spectacular! So, true to form, Francine, you have created beauty!! Your skills are unparalleled. You shine and you create works of art. I love that you help Mendi to celebrate Sunny Studios Stamps!! You are an artist!! Sweet, beautiful cards. I love those alpacas. Really adorable cards! I love the little alpaca with the snow boots! 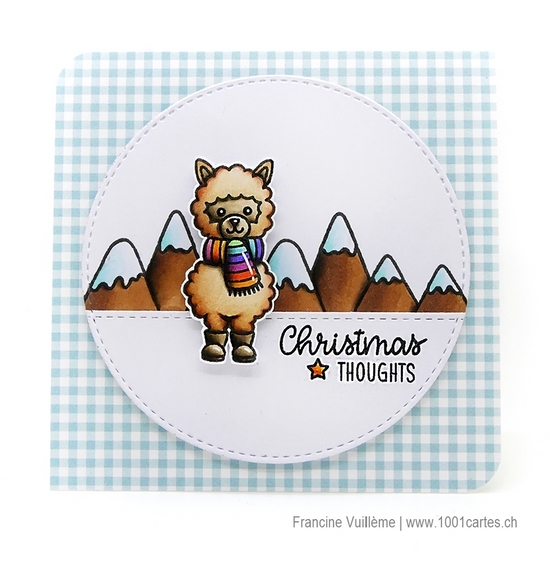 Fabulous cards - those alpacas are just too cute! I really love the third card where you worked your magic with those dies!! Love the adorable alpacas and your coloring. My favorite is the rustic winter scene with the deer. That is so pretty! Beautiful cards! Thank you for sharing your talent with us! I love that you use color and your cards are beautiful and fun...those boots on the llama...stop it! Love it too much. Your “rustic” card is gentle on my mind. Such adorable projects! I can't pick a favorite, but those alpacas in their rainbow accessories are so cute! Awesome projects, love the Alpaca set, and your rustic winter card is so lovely. Fabulous cards -- love the addition of the glossy accents on the scarves & hats. They totally pop with that. But the third card is so incredibly peaceful. Really beautiful. Die cutting the deer silhouettes is AWESOME! But the way you color is AMAZING! Love your llama! Love the pop of color in the background of two of the cards. I love how it spotlights the images! Your coloring is always so well done, and I'm in love with that last card, it's just so perfect and CAS, such a sweet vignette! These cards are really terrific Francine. I love your coloring of the Alpaca's. I especially love your 3rd card. It's so perfect for a beautiful Christmas card to be sent to friends and family. Thank you for the inspiration!